Looking back over very many decades, gold has been a very poor long-term buy-and-hold "investment" compared to asset classes like stocks. Long-term investors should never lose sight of this. Gold is usually not considered an "investment" but rather a form of "capital preservation" -- like hiding money under your mattress. Gold doesn't "work" to generate income like a for-profit corporation works to produce goods and provide services. Gold doesn't pay dividends either. Gold just sits and collects dust. 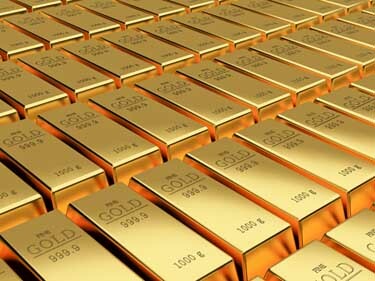 Furthermore, unlike other commodities such as oil, coffee, cotton, etc, the supply of gold never gets used up. It just changes hands. Also miners continue to extract more gold, and this negatively effects the price of gold. It's simple supply and demand. Gold is taxed at the higher "collectibles" tax rate (usually up to 28%) whether you buy physical gold or ETF gold. Dealers of physical gold also charge perhaps a 5% to 6% markup over the spot price of gold when you buy bullion (not collectible coins). The most reputable dealers (such as Wilshire Coin) don't charge any markup when you sell. So when comparing gold to publicly traded bond and stock ETF's, the potentially higher tax rate and the high 5% - 6% dealer markup costs are significant and should make anyone think twice before investing a lot in metals. On the bright side, gold is a tangible asset that cannot be "printed" as paper currencies can be devalued. Accordingly gold has historically been perceived as a hedge against depreciation of the US dollar -- government "printing" (or spending) money that it doesn't have, as well as bank failure / loss of uninsured cash deposits. Gold prices are highly tied to investor sentiment. Negative sentiment about the market (stocks, bonds, the economy, etc) tends to send gold prices higher. And improving perception about the economy tends to send gold prices lower. Gold can also be looked upon as a hedge against stock market collapse within a diversified portfolio of many investments. When stocks collapse, gold tends to perform considerably better. Jim Cramer likens gold to an insurance policy against economic or geopolitical chaos, uncertainty and inflation. When stocks fall in response to these negative things, gold tends to go up instead, and this minimizes your downside risk. Very wealthy people who normally keep bank deposits over and above the FDIC limit of $250,000 may look to hold gold instead. Don't ever be confused into thinking that gold is the only hedge against inflation. Gold dealers often boast about gold being "a hedge against inflation". The operative word is "a". Gold is just one of many hedges against inflation. So are any other assets such as oil, natural gas, farmland, and to a lesser degree commercial real estate. Even stocks can be a hedge against inflation. As a hedge against inflation you might fine tune your stock asset class holdings to include ETF's like IYM (basic materials) and VDE (natural resources). In this chart (below) we see that by the end of the 2008 to 2009 stock market collapse, gold performed more than 50% better than stocks. However don't lose sight of the fact that bonds are generally what most investors use to hedge against stock market drops. When stocks crash, money runs to the safety of bonds. Gold is all about timing. Time it right and this is a road to riches. Get it wrong and you'll miss the train while other investments like stocks move upward. If you bought gold at it's peak in 1980 and sold at it's low in 2001, then during that long 21 year cycle gold went from an average of $612 an ounce down to $271 an ounce. Meanwhile stocks went on a tear. Gold was definitely not the place to be then! But from 2001 to 2011 gold went on a tear from a low of $256.60 to over 1,900 an ounce. Gold has since declined significantly. Is this the end of a bubble or will gold bounce back and appreciate even further? There are many forces (debt, inflation, bond prices, investor attitudes and perceptions, etc) that all affect gold prices. Bubbles may move in slow motion over many years. The main argument to own gold is that massive government debt is not going away any time soon. Some alarmists argue that quantitative easing is not doing much of anything to spark the economy and that the Federal government may eventually have to default on obligations (a so-called "debt reset" scenario), in which case gold may be one of if not the only safe havens. Even if this were to play out, it might not happen for a very long time (as stocks continue upward). The reverse argument is that the economy will improve to the point that the Federal defect can be reduced. Bears will say that the United States' national debt is too great and that our national debt likely cannot be paid back. However there are many other factors that effect the price of gold. India and China account for 40 - 50% of the gold demand, so what they do has an impact on gold prices. Some believe that the Federal Reserve shorts gold on a massive scale in order to drive the price down and this in turn flushes out fair weather gold investors. So far the recent dire predictions have not materialized. Many of the doom and gloom predictions come from people who sell gold. The way to sell something is to scare them. From 2003 to 2011 gold vastly outperformed stocks. However going back many decades gold has lagged. From 1979 to 2008 all stocks returned 11.93% annually, whereas gold only returned 5.36% per year. Author and gold dealer Mike Maloney has pointed out a gold VS stocks cycle that has occurred over the last 100 years. When stocks have fallen out of favor (bear markets), gold has gone up. When stocks have risen in value (bull markets), gold under performs. Had you played this cycle, switching from stocks to gold or gold to stocks, you would have accumulated great wealth. Based on his cycle model he believes that stocks still have not reached rock bottom and gold still has to go up. He believes that sometime this decade there will be a worldwide currency collapse and a rush to gold and silver. But again, he sells gold, and historically there has not been any correlation between currency prices and metals prices. On the other hand, financial guru Bob Brinker said on 1/18/2015 that the people who are predicting a collapse of the dollar "should hang their collective heads in shame for the bad advice they have given people. Not only has the dollar not collapsed, it has skyrocketed in value. These people are nuts! " How much to invest if any? Here's what a range of prominent financial gurus / media personalities have to say about gold. Jim Cramer, former hedge fund manager and TV host - 12/30/2014 - Recommends up to 10% in gold as an insurance policy against geopolitical events, uncertainty and inflation. Clark Howard, consumer advocate - 12/16/2009 - Limit to between 5 and 10 percent of your overall portfolio if you choose own gold as an investment strategy. Bob Brinker, radio host and financial adviser - 1/18/2015 - Says gold has no intrinsic value -- Only speculative value. He says "I don't own it and I don't have any plans to own it". Bob has apparently at one time or another recommended the ETF GLD through his market timing newsletter. Ric Edelman, radio host and fee-based adviser - 2014 - For clients who insist on owning gold, Ric seems to reluctantly give them the OK to own no more than between 2% and 5%. The portfolio generator on his website tends to recommend only 4% but in all different types of commodities including gold. Suze Orman, TV host - 9/21/2012 - No more than 10% or 15%. Martin Weiss, alarmist and publisher of investment newsletter - 2012 - Recommends about 5% of specifically gold bullion, although this is for his very conservative portfolio. Weiss does not recommend the ETF GLD. Peter Schiff, broker and gold dealer - 2014 - Says that most of his clients are positioned between 15 and 20%. One thing for sure is never be swayed by paid gold dealer commercials, which are inherently biased. Of course they will always paint a bright and rosy picture of gold and silver. Just ignore these commercials! Keep in mind that every investment has risk. Accordingly, never abandon diversification even when you are convinced that an asset class is going to do well. If you have more than 20% invested in gold then you need to take a hard look at the excessive risk you may be taking by putting a lot of eggs in one basket. Not one of the above "gurus" recommend more than 20%. Think that the market is going to crash soon? Remember that Alan Greenspan warned of stock market over valuation in his irrational exuberance speech but then the market proceeded to go up for nearly another 4 years. The lesson learned is that timing the market is dangerous. Experts will tell you that the best approach is to stay sensibly diversified. Even gold bull Peter Schiff recommends investing in mainly stocks (in addition to up to 20% in gold). You may even decide not to invest in any gold at all. 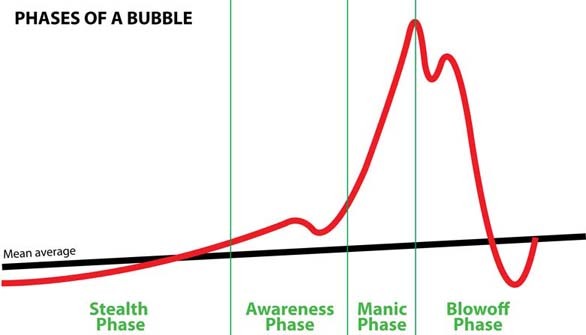 Are we in the awareness phase or the blowoff phase? If you buy physical gold that you will hold in your possession then I say absolutely be sure to do business with a local dealer where you can make the deal in person -- not via mail! While very rare, it has happened that dealers have inadvertently sold fake gold. It costs the bad guys about $500 to make these fakes, so with gold as high priced as it is now, this has spawned a new industry for ambitious thieves. They are getting better and better at making fakes. With that in mind I say that you absolutely want to do business with the most high profile local dealer in person so that you can have them test the coins in front of you. I beleive that local gold dealers are more likely to want to earn your trust and business. Do not buy the more expensive collectable versions of coins such as proof coins, limited mint coins, mint condition coins or uncirculated coins. Stick with basic gold bullion 1 ounce or smaller sized American Eagle coins that sell for the going market price of gold, plus small dealer markup. Typically dealers charge a markup to sell coins but may pay the full spot price when buying coins from you. 1) a precision scale ($100.00), a precision caliper ($25.00), and some coin weight and size specification charts (usually found online for free such as on this site). TIP: You will want to buy a comparable silver coin to serve as a "weight" to test the accuracy of your scale. My cheap $25 AWS scale actually reports 1.0909 ounce gold Eagle coins as being 1.1999 ounces (or about 10% heavier). But my silver Eagle coins also weigh in at about 10% over, so I know that it is just my imperfect scale. Note that gold Eagles have about a tenth of an ounce of metals added for firmness. Silver Eagles, which do not have extra metals added, should be 1 ounce. You can buy test weights but even these may not be accurate. A silver Eagle is probably your best "test weight" to see how accurate your scale is. 2) a neodymium magnet ($5.00). Gold and silver are NOT magnetic, so any magnetism indicates a fake. Never rely on this test alone as counterfeiters typically use tungsten which is non-magnetic. 3) an ultrasonic thickness gauge ($100 - $200). For example lead and silver are have very similar density, but sound travels through them at very different rates. An ultrasonic thickness gauge can measure how fast sound travels through coins and bars. This testing device is very important because counterfeiters are apparently now able to beat the size, weight and magnetism tests. 4) There are also visual tests to check for detail magnifying glass, as well as simple alignment tests comparing the clock positions of the front of the coin with the back. Compare the coin you are testing with a coin that you know is real. 5) You can also do a sound test whereby you lightly knock the coin against a hard surface. Real coins have a distinctive ring. Compare the sound with a known real coin. Want to invest in gold but don't want to bear the burden and risk of taking possession of physical gold coins or bars? Consider the SPDR Gold Trust as traded on the NYSE under the stock symbol GLD. For silver investing consider the iShares Silver Trust ( symbol SLV ). Note that the price of silver is prone to more wild price swings than gold because silver has a lot of industrial demand, and because there is a history of silver futures contracts being controlled by just a few traders. In April 2007, it was reported that four or fewer traders held 90% of all short silver futures contracts. Also consider investing in mining stocks. With mining stocks or ETF's such as GDX and GDXJ you will enjoy the benefit of only having to pay capital gains taxes if held for a year or more. As a note of caution, gold stocks got hammered by the 2008 market crash even more so than ordinary S & P 500 stocks did. However gold itself suffered a significant decline but not as much as stocks. One note of warning about the SPDR ETF's GLD and SLV is that you are putting your trust in the mega-bank HSBC to serve as the custodian of the bullion. Any time you own a "paper asset" versus physical gold, then you are putting your trust in the system. Alarmists will cite MF Global, Enron, Bernard Madoff, Executive Life Insurance Company and other cases as examples that anything can happen with paper investments that are supposedly "safe and secure". Gold and silver ETFs use futures contracts to buy and sell metals and therefore there could be risk of delivery failure. Some critics caution that shorted shares of metals ETF's may not be fully backed, which in turn could result in default. When MF Global collapsed, investors who held receipts for gold and silver bars had their assets frozen and pooled with those of other MF Global customers. Investors were told that they would only get back about 72 cents on the dollar. At this point investors have apparently been paid back 80%. With the ETF GLD you are also losing 0.40% per year in annual expenses. On the flip side you would be presumably paying about 6% to a dealer when you buy physical gold. You would need to hold on to your physical gold for about 15 years in order to justify paying that 6%. If you store physical gold you also run the risk of loss due to such things as theft and flood. So from the perspective of expenses alone, it makes sense that the ETF GLD is much more cost effective for short term trading. When factoring in all of the risks on both sides of the isle you might want to at least consider diversifying between the two. Risk of government of confiscation? On April 5, 1933, President Franklin D. Roosevelt forbid the hoarding of gold within the continental United States. The order criminalized the possession of monetary gold by any individual, partnership, association or corporation. Could the US government pull this stunt again to prop up it's declining dollar? For this reason some US citizens store their gold in banks outside of the US. Experts don't seem to think this could happen again but nevertheless it is a risk to consider. Such a move would certainly affect the spot price of gold and probably adversely. One thing that investors have no control over is the buying power of gold. Alan Greenspan spelled it out when he said "We [the US government] can guarantee cash, but we cannot guarantee purchasing power!" Essentially the government doesn't need to confiscate people's gold. They instead confiscate gold's purchasing power through inflation (printing money). Some claim that the Federal Reserve manipulates the price of gold through futures contracts. Here is the best article I've found on this topic. If you believe the story the question still remains. Is this cause to buy, sell or hold gold? Dealers have great incentive to convince you to buy collectible or rare coins. The markup to buy bullion is only about 5%, whereas numismative coins typically have much much larger price markups. If you own gold then you want to own plain old gold bullion, such as American Eagles. You want to own coins for the value of just the gold -- not for any collectible value. Beware that metals like gold (including the ETF's GLD and SLV) are considered "collectables" and if held one year or longer you may pay up to 28% in income taxes (rather than the lower "capital gains" tax rate that you would typically pay with stocks and mutual fund gains). Metals held less than one year are taxed as ordinary income, just like short-term capital gains on stocks or bonds. Thinking about not reporting gold profits to Uncle Sam? Don't do it! Coin dealers are required to record customer names when that customer purchases over a threshold amount of typically $3,000 in accordance with anti-money laundering regulations. Dealers must record and hold the information only for IRS inspection, although it is not automatically reported. NOTES: According to Jonathan Barratt of Barratt's Bulletin, the cash cost of production of gold is around $1,200 an ounce. According to Dundee Capital Markets the average total cost among top 20 gold miners was $1,306 per ounce. But, even if every gold miner ceased to operate, gold is a commodity that never gets used up. It just changes hands.